Roy Rogers was one of the biggest country western stars of his time, known as “The King of Cowboys”. If there was any doubt, one only had to look at his resume, which included over 100 films, numerous albums, a long-running radio show and a hit television show. Roy and Dale in Nellybelle with Pat. 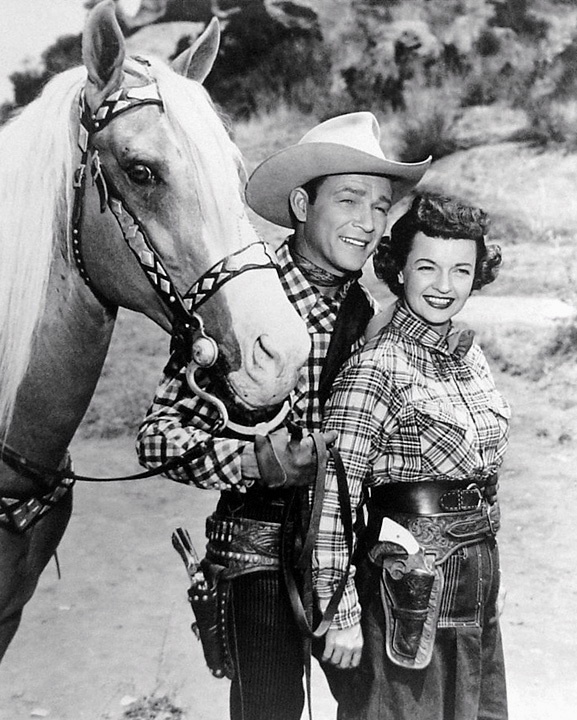 The Roy Rogers Show was the name for two consecutive programs that aired around the same time. The first was a radio show with a greater focus on Rogers’ music, the second the television show with a greater focus on adventure, and both airing on NBC networks. The show starred Rogers as a ranch owner, his real-life wife Dale Evans as the owner of the Eureka Café and Hotel, and Rogers’ long-time comical sidekick Pat Brady as Evan’s cook. Also featured were Rogers’ horse, Trigger, and his German Shepherd, Bullet. 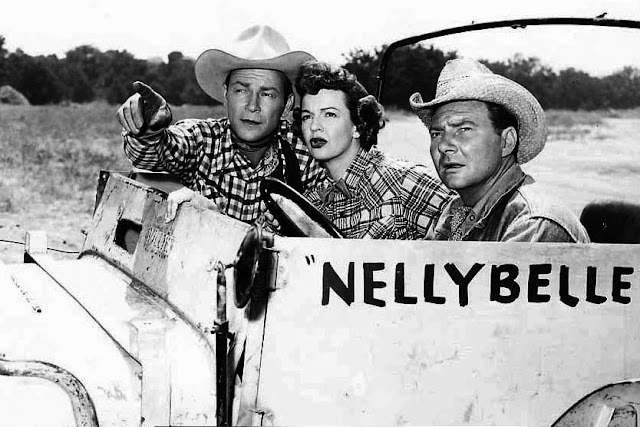 Like other productions starring Rogers, the characters were firmly entrenched in 19th century Americana while inexplicably co-existing in a 20th century setting (Brady, for instance, drove an unreliable Jeep named Nellybelle). Rogers and his friends would help the weak and defend the defenseless against a variety of scoundrels. The Roy Rogers Show debuted on NBC on December 30, 1951. The show’s theme, “Happy Trails”, was composed by Evans and sung by her and Rogers over the end credits of every episode. A wave of merchandise followed, including comic books, playsets, costumes, toy weaponry, and a widely syndicated comic strip. The show ran for 100 episodes over 6 seasons. In 1961, CBS acquired the broadcast rights for the show and included it on its Saturday morning line-up through 1964.